No matter how bad you want your catch, you can't force the rarest fish species out of their hiding place without an effective luring fly. With a fly, you don't have to risk the deepest ends to reach your favorite fish. Just place them safely on the surface of the water, allow them to sink or float, and wait for your fish to take the bait. Before you buy any fly, it is important to know what will work for freshwater, saltwater, and the Weather condition in your fishing spot. If you are using dry fly or nymph fly and you are not getting best results, then Wet fly might save you the effort. A wet fly is one of the oldest forms of fly fishing but has remained the most efficient compared to other types of fly fishing flies. Wet fly shares a lot of similarities with a dry fly. However, they feature legs that are much softer and wings that are slanted. They represent the dead or alive insects moving under the water. In particular cases, they are used to represent a variety of sea creatures such as leeches, Crawfish and more. Unlike wet flies, dry flies float at the surface of water forcing fish to get out of their hiding. Due to this, you will know when the fish has swallowed your fly. Dry flies are specially intended to mimic either a dead or alive insect that floats at the top of the water. Examples of these insects include stone flies, caddis, and many other flying insects. They can also appear as ants, grasshopper and many other land insects that rest on the surface of the Water. For a dry fly to continue floating, it is vital that you oil or dry it several times when fly fishing. The good thing about dry fly is that it brings fish to the surface which is quite fun for many anglers. The only drawback is that most fish will hesitate to come to the surface depending on the Water pressure. Streamer fly fishing is all about a swimming prey. Unlike both the dry and wet fly, it doesn't imitate a dead or alive insect, but a prey fish that is swimming through water. More often it imitates a variety of bait fish that include, leeches, minnows or anything that Swims through Water and is forgettable by medium-sized or large predatory fish. Unlike, Wet or dry fly, it requires a particular type of skill to mimic a Swimming prey accurately. As a result, you can't apply Dry or Wet fly rules and expect it to get large fish out of their hiding. Using a steamer requires you to take control. If you want to get the fish to take the bait, you must work on the fly. You must also cast your line out to a possible spot in the water and then make short or longer pulls depending on the size of fish you are targeting. You also need to make your fly look live lure than dead if you want to catch some of the rarest fish such as sea monster and the rest. The best thing about streamer is that it makes it easier to catch large fish, unlike dry and wet flies. The only downside is that using a streamer requires a particular skill to use it effectively. A nymph is another version of wet fly but represents an insect that lives underwater and is leaving its cocoon. A nymph targets a variety of fish that like eating insects in their larval stages such as caddis, mayfly or stone fly. Compared to other types of fly fishing flies, a nymph is rated the most effective when it comes to catching fish that rarely get out of their hiding such as trout and the rest. Just like a wet fly, it might come to the top. So, most anglers add weight to ensure it stays at the bottom of the lake until a fish in hiding realizes it. Just like a streamer, using a nymph requires some specific skills to figure out where the fish is hiding, lure it to take the bite and pull it out. Because seeing the fly while it is under the Water is hard, you are required to use a strike detector to monitor your fly. A strike indicator will move, stop moving, slow down or move up if the fish swallows it. The best thing with the nymph is that it makes catching fish that is in hiding much easier than other flies. The drawback is, it may take more time to realize that the fish has taken the bait. Saltwater fly is simply intended to catch some of the rarest large and medium-sized saltwater fish such as sea monster, redfish, stripers, bluefish and more. Unlike the nymph, wet and dry fly, it represents fish instead of an insect. When salt water flies are exposed to the sun, the sun's rays reflects on their scales making them look like minnows. Just like a streamer, saltwater flies require you to employ a variety of skills to catch some of the amazing salt water fish. You must be in full control of your line to accurately imitate the movement of minnows if you want to trick your targeted fish into taking the bite. You must also be able to flow with the guide; immediately you spot your fish. The point is, being able to work with your guide and line makes saltwater fly fishing easy and fun. Saltwater fishing can be fun or boring depending on the type of fly you use and your skills. You must be in a position to take full control of your line, flow with your guide and most importantly, focus on the strike. 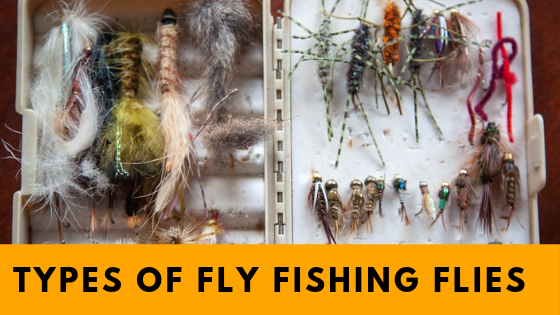 Depending on how you flyfish, the five main types of fly fishing flies mentioned here offers you many of options to make a successful catch. If you enjoyed reading this, share it with your friends. Comments are welcome.